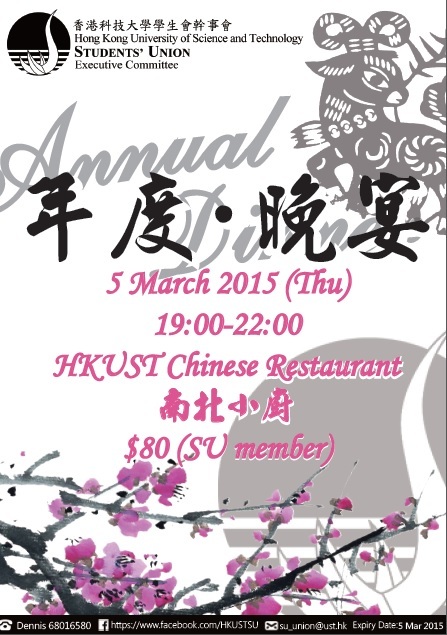 The Annual Dinner of the Hong Kong University of Science and Technology Students' Union will be held on 5/3/2015 at the Chinese Restaurant in HKUST. This year we are honored to have HKUST President Tony Chan, Representatives of different School Offices and Professors as our guests. This is a great opportunity for our members to interact with the school authority so as to have a better understanding of the operation of the University. Don't hesitate, Join us now!